NPR brought my attention to this great research by Catherine Riegel-Crumb from the University of Texas. The bottom line: “fewer girls may be taking courses that lead to tech careers when they don’t see female role models already in tech careers”. The reporter described it as a chicken and egg problem. Go listen to the piece (c’mon, you have 4 and a half minutes to spare…) then we’ll come back and discuss. Seriously, though, the NPR piece and the original research suggest that girls are more likely to enroll in physics if there are a significant number of female role models working locally in STEM careers. Ok, so we need some trailblazers who are willing to go out there and be the first role models for young women. 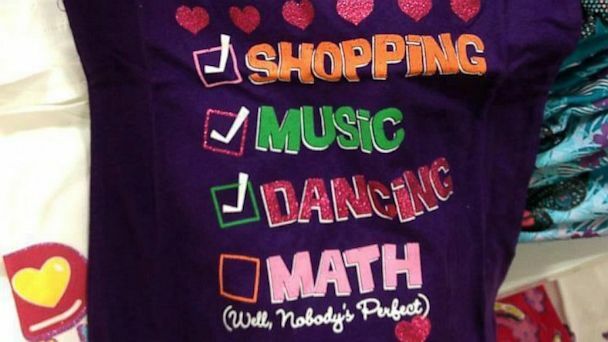 We need to encourage young women starting early that math and science are worthy of their attention, despite what the shirt says. Wait, wait, wait, I feel like we’ve been having this conversation for 30+ years. The trailblazers in tech fields were in university in the 70s. Why are we still talking about this problem? Where are the women? The saddest part of this problem is that I feel powerless to help because I’m not a role model. My hypothesis: a female physics teacher isn’t a role model for future physicists because the kids mentally drop the physics and see only female teacher. That’s a shame. Case in point: I’m one of those non-role models. Female, engineer, physics teacher, robotics coach, and geek. So is my colleague, also named Meg(h)an. I think though, that the fact we hold the title of Teacher negates most of the role modeling we could be doing. We’re still working in a traditionally women’s role. I’m left with only questions at this point. How can I become a role model for future physicists, engineers, and mathematicians? How can I encourage just a few women to be the trailblazing future role models? How can my male colleagues do the same work? Is it even possible? Ok, so I don’t actually know what the research says after the first page because it’s paywalled in an academic journal. Don’t get me started on that. Oh boy, y’all are going to jump all over this statement. Keep reading and you’ll see why. I am fortunate enough to be married to a beautiful woman scientist. She has her PhD and is working on developmental biology. She is also interested in outreach for science in general, but also for women. When she comes and talks to my classes at the end of the year (even if it’s not really related to the topics we’re studying in class), she dresses nicely (no labcoat–most “real” scientists don’t wear them unless they happen to be working with dangerous chemicals that day, but even then it’s only maybe 5 days a year) and shows herself to be intelligent and competent as well. Her post-doc advisor is also a cute young woman (a few months younger than I am) and her department chair is a well-dressed European woman. Maybe it’s just my circle that has that bias or maybe women seek out other women (even subconsciously) and form those kinds of groups. So, if you’re worried your students think of you only as a teacher, could you bring in a guest for even a day (even over google hangouts or something)? It would be especially great if you were to know that person more casually so that it didn’t look like you had to go hunt down the only female physicist in the state or something, but even that may be better than nothing? Excellent point — I’ll drag my techie friends to school as guest speakers. Love your point about women possibly seeking out other women. That would be an interesting hypothesis to research. Certainly, Riegel-Crumb suggested similar with her emphasis on female role models attracting females to tech fields. I am a chemistry teacher that would have been counted as one of those women that “dropped out” of science: I was well on my way to my PhD in chemistry, but decided to write up a Masters thesis, raise my kids, and head back to the classroom and varsity coaching. I was never barred from progressing in science, I made a distinct choice. (My husband is a research chemist and I am glad to have only one of them in the family.) I don’t think there is a conscious effort to dissuade young women from physics/engineering. I never felt that. I model enthusiasm for chemistry to ALL my students and they choose subjects in which they have an interest and those that fit their unique interests and goals. I hear you about choice. Interestingly, your choice is something men almost never make. As for conscious dissuasion, I agree that’s pretty rare nowadays. I certainly wasn’t ever told “women don’t study engineering, why don’t you go over to the college of education?” However, one great example of subtle dissuasion just came in from @HannahTolla, “When I went to a profs office hours, got stopped literally 5 times in the building asking me if I was lost – I didn’t fit in.” I got the same thing every time I went to the machine shop next to my lab at university. Did this ever happen with you? Oh, I don’t know about the number of men making that kind of choice, but there are certainly more of them now than there were when I was graduating from college and it’s acceptable, too. I tell the young men that I teach (my twenty-something son, too!) that they now have the flexibility to ‘marry well,’ and perhaps be able to pursue different, maybe lower-paying, careers if they want. Think about the difference for men now than in my parents’ time: so few women worked outside of the home, it was all on them to ‘support the family.’ None of my friends in the early 60s had mothers working outside the home. No one ever tried to talk me out of science. I was far too academically competitive for that to even come up as a matter of discussion. Both my research professors, in undergrad and graduate school, thought I would get bored teaching and tried to talk me out of that choice. Perhaps they were ultimately right on that score, but it’s been a fun ride in the chemistry classroom and coaching cross country and track, so no regrets, no longing for science. And I certainly do not have the feeling that I let down women by opting out of a ‘high-level’ science career. Teaching allowed for an awesome schedule for raising kids and I had the honor of being able to teach my own children for two years each in high school. By the way, both my son and daughter are working as chemical engineers. Both women and men can now make choices that 30-40 years ago were not easy to make. That’s great. I think it’s connected to the research about girls caring more about developing a story when playing with building toys. I think forming a community that started with people and then used physics to make things better for the people would be key; as it is, you learn all that physics stuff and then if you’re lucky figure out some way that it makes things better for people. If we want more female engineers in the pipeline perhaps local businesses and corporations would be willing to partner with area middle and high schools to help make the few women in the field more visible. I’m thinking out loud, but maybe you and your colleagues could meet with them to brainstorm possibilities–sponsor an after school program, create and show brief videos of women at work solving the kinds of problems posed in the classroom. I haven’t used this website, but here’s an interesting kickstarter video and there might be some fodder here. I’m all talk; now I need to be more go!